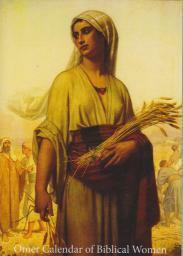 The Omer Calendar of Biblical Women is a journey through the seven weeks between Passover and Shavuot. According to the Kabbalah, each of these forty-nine days embodies a unique combination of Divine attributes, or sefirot. The calendar also contains illustrations from classical paintings and modern midrashic art. The author of the calendar is Rabbi Jill Hammer, PhD, author of Sisters at Sinai: New Tales of Biblical Women and The Jewish Book of Days: A Companion for All Seasons. Rabbi Hammer is Director of Spiritual Education at the Academy for Jewish Religion. Shir Yaakov Feit, Creative Director of Romemu, New York City’s Center of Judaism for Body, Mind, and Spirit, designed the calendar. You can view a sample online at Issuu. Learn more on Facebook: Omer Calendar of Biblical Women. Posted in Books, Sefirat haOmer and tagged Rabbi Jill Hammer. Bookmark the permalink.